It was on Dec 18th, 2008, that I posted a campaign idea to both Dragonsfoot and to my (now defunct) Old Guy's RPG Blog. It is a dark time. Much has changed in the world that your forefathers and granddams knew. It was 55 years, almost an entire generation, that the skies lit in flames, the world cracked open, the beasts and bestials poured from the dark and civilization retreated. 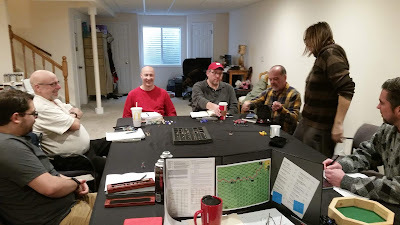 About a month later, in January of 2009, the first Dark Ages (now Etinerra) game was played to a group of folks at the well-known Chicagoland FLGS Games Plus. Ten years, well over 300 people later, the campaign is still rolling on, with currently three separate D&D groups, an ongoing wargames campaign and lots of one shots and events taking place at conventions. 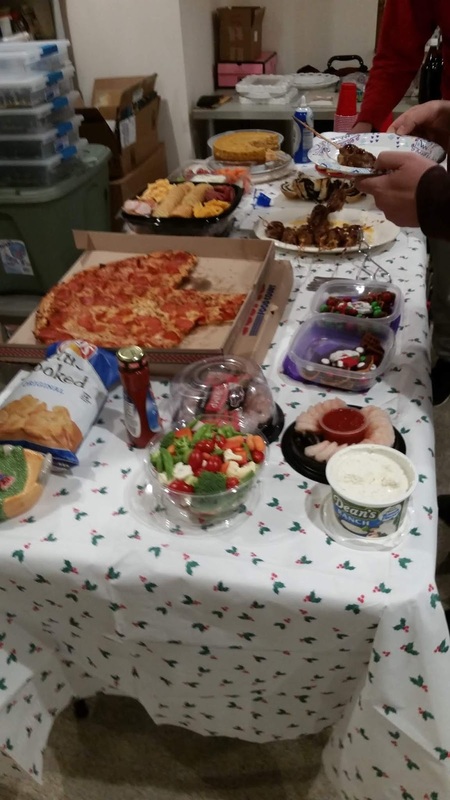 We held our December Holiday Game & Feast on Sunday, December 9th. Eight players and two guests showed up, including one new player! Welcome David! 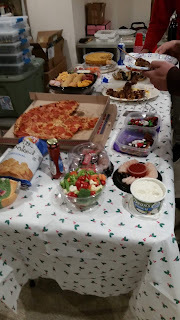 Rats-on-Stick were eaten, as well as Rich's amazing fennel cookies, a scrumptious pumpkin cheesecake, pizza, candies and snacks, with homemade Holiday Ale to wash it down. Orcs were killed, a jousting tourney was had, a magical sword was bought, plans were made, pockets were attempted to be picked... it was a great AD&D game! By now, I think my Rizzoma folks have received their gifts, so I will share with you all what I gave as tenth anniversary keep-sakes. I bought some goldenrod paper and printed off AD&D character sheets and Permanent Record Portfolios for all my players and their characters. 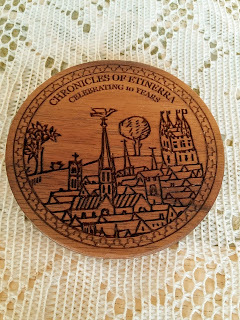 I also commissioned a gentleman in Wisconsin, Alex of RPG Coasters, to produce custom 10th anniversary wood coasters and gave one to each player. Alex did a fantastic job and I highly recommend checking out his wares. This campaign has seen quite a personal journey for me in how I DM. When I started ten years ago, I had just come into the so-called OSR from playing microlite20 with my wife Angie. I wanted to create a campaign that used the game I remembered from my adolescence. I could barely remember the particulars of AD&D, but with three hexes on a map and some sketched ideas, a campaign grew. The game was played on tabletop in two campaigns with groups side by side, West Marches style. I also ran an online play-by-post game on Google Wave for five folks. That all lasted till mid-2011, when I took a hiatus from gaming for awhile. Angie and I started a multi-year personal project that took us on some incredible real-life adventures together, but in mid-2015, the campaign started back up, both tabletop again and on Rizzoma, a Google Wave clone. It's been rollicking along ever since. I never stopped thinking about the campaign world and even in that break, I was writing and creating and trying to put into words the thoughts and ideas that I think about. Etinerra is probably a bit of a compulsive obsession for me. It's rare that I don't have a week go by where I come up with some tidbit that I need to express. It's in my blood and it doesn't let go. Things have changed in my campaign though. How I run the campaign has gone through some pretty big shifts. When I started out, I was all grimdark, trying for realism and "this is what a sandbox would be." I realized that was not the game I wanted to run. So, I changed how I approached the game, and that's why I'm at 3.5 years and still having a blast! There are three things I've learned over the course of this ten year journey that isn't over by a longshot. Maybe you'll find them useful, maybe not. They are lessons that stick with me. They are things I'm going to write about in the future. 1. The game belongs to me and my players. The fun for me is in discovery and exploration. When I create my sessions in Etinerra, I'm setting up the world for the players to do things in, if they want. I have no idea what they'll do and they end up surprising me fairly regularly. So I am uncovering things during prep, but I'm also learning new things when they explore the world. It couldn't happen any other way. 2. Go where the flow takes you and your interests - it all adds up! Development on my campaign is not linear. I have urges, interests, sparks of inspiration that have taken root for awhile. I've learned to follow them where they lead. Using a wiki and Google Drive folder to hold documents helps me to keep these bits around for when I need them, or need to be inspired by them. As long as it adds to the overall lore and fabric of the world, it's valuable - even if just to keep me inspired and moving forward! 3. Always keep an open mind to change and letting go of stuff that simply doesn't work (anymore). I know I started out with things that I thought were important - you know, those Great Ideas! And after some play, I realized that those ideas weren't so great after all. If it's taking away from the enjoyment of the campaign for me or my players - then why keep it? Traditions are great, but this is a game we're playing. At the end of the day, I want people to value the time they spent in my world. Time is the one commodity that we all don't have limitless supplies of, and we can't get it back once we've spent it. So I want someone's time at my table to give them a return of some sort - whether it's "fun" or challenging or meaningful. Hopefully all three! I say this quite often, and I completely mean it - I have the best players in the world. They explore a world with me and they share their time and energy with me and I'm very grateful for that. They've helped to shape a world that feels so alive when they are playing. If you're playing in, have played in or contributed to my campaign - thank you. Etinerra lives because of you. Do I want this to last another ten years? Oh hell yea! There are Dark Ones to face, mysteries to solve and dungeons to delve! Congratulations, Michael to you and your group. Here's to another decade of fun ! Thank you Rick - another decade would be something, now, wouldn't it? I can hope I'm that fortunate! 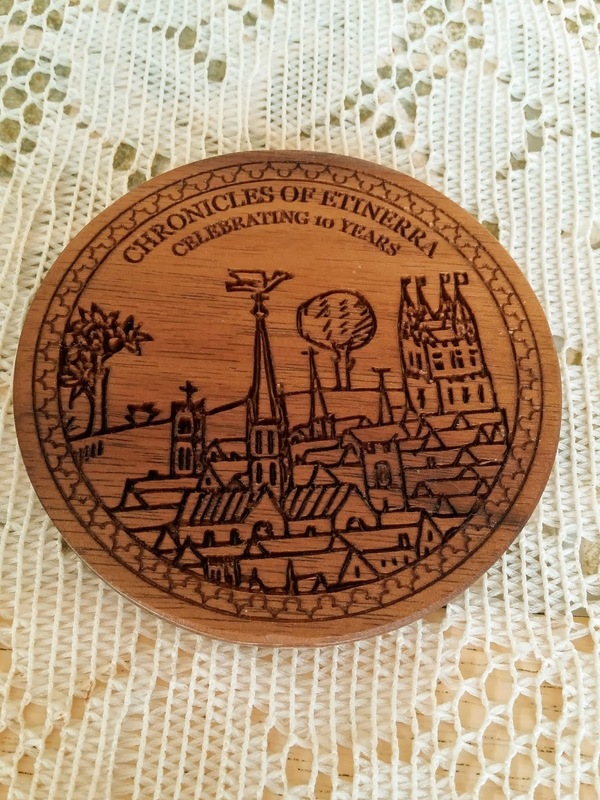 Thank you Michael for running Etinerra, it has been so much fun to be part of your creation. Thank you for being a part of my campaign! Rad. I really enjoyed your podcast episodes explaining how you run your campaign. Fascinating. Thank you! I wish the podcast had worked out differently, but live and learn!